These t-shirts will let everyone know that you have adopted an attitude of Gratitude! The bold red lettering on a plain white background creates a striking contrast and the inspirational words will help you to remain focused on life’s positive energies. 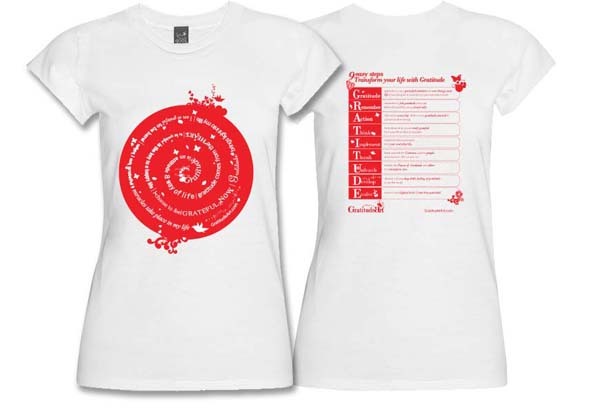 These t-shirts’ plain white background serves as a visual tabula rasa, a reminder of all the opportunities that you will have to write your own Gratitude story, while the curve of the red lettering hints at the sometimes convoluted road that life takes us on. To provide an eye-catching statement of your new attitude! Let the world know of your belief in the power of the universe and your determination to embrace Gratitude as a way of life.